At twenty-six, Mercy Dane, who aged out of Georgia’s foster care system at eighteen, has spent five years in a dead-end job as a waitress at the Road Warrior Bar in Savannah. Although Mercy’s boss and co-workers have become her friends, it is a limited friendship because Mercy’s protective shell is thick enough to be almost impenetrable. She is very much a cat who walks by herself. That begins to change early one Christmas morning when Mercy gets a phone call asking if she can come to Blessings, Georgia, to give blood to a woman critically injured in an automobile accident and in desperate need of RH negative blood. With no hesitation, Mercy hops on her Harley and hits the interstate. Slightly over an hour later, she arrives at the hospital, pursued by the local police chief who thinks she is a stranger speeding recklessly through his town. Chief Pittman will discover that he is wrong on both counts: her speed is not prompted by recklessness, and she is not a stranger to him. As Jack Talbot and his brother Duke, the husband and brother-in-law of Hope Talbot, the accident victim, are thanking Mercy for her help, Duke notices a resemblance between Mercy and his sister-in-law. He also notices that Mercy has an unusual birthmark, the same birthmark Hope has described as an identifying mark on her long-lost younger sister. Mercy scoffs at the idea that she could be that sister, but Duke persuades her to agree to a DNA test. As if that were not shock enough, Police Chief Lon Pittman turns out to be the man who befriended Mercy eight years ago when she was robbed and had nowhere to turn. Lon represented safety to her that night, and the two became lovers. Mercy fled the next morning, and Lon, who never forgot her, was never able to find her. Once the results of the DNA test confirm that Hope and Mercy are sisters, Mercy moves to Blessings to get to know her sister. She also discovers that the persistent Lon, who is all that he appeared to be when he rescued her eight years ago, is difficult to resist. But not everyone welcomes Mercy to Blessings, and she has some battles to fight before she can claim the small town as home. Despite the cruelty of the adult equivalent of teen mean girls, Blessings with its familiar cast of characters proves that it can take care of its own and that it considers Mercy one of them. 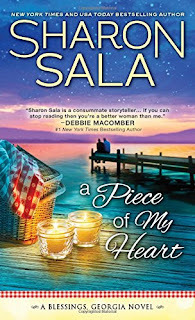 A Piece of My Heart is the fourth book in Sharon Sala’s Blessings series, and it has the heartwarming appeal of the earlier books. Mercy, who is both tough and vulnerable, emotionally needy and independent, is an interesting, sympathetic heroine, and Lon is courageous, honorable, and patient enough to deserve her love. Unfortunately, the number of coincidences pushed the story into the unwilling-to-suspend-disbelief zone for me. The lost-sister plot and the reunion of the one-time lovers was one coincidence too many for me to accept as plausible. I was also bothered by the inept villains that seem to be a recurring motif in these books. Nevertheless, I still find Blessings, as insular as it seems at times, an amusing place to visit. The colorful Ruby Dye (Sorry. I could not resist that pun) continues to pull strings, accomplish good deeds, and win the hearts of readers. I like Ruby, and I am intrigued by the ongoing Ruby-Peanut Butterman thread. I hope they get their own book soon. 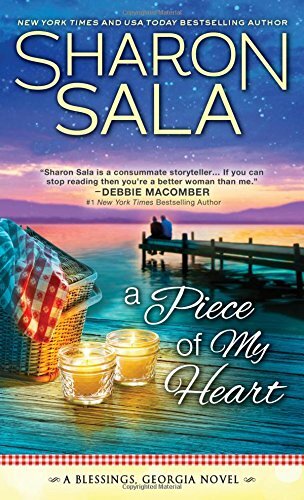 A Piece of My Heart is not the strongest book in the series, but fans of the earlier books will find it rewarding despite some flaws. If you are new to the series, I suggest beginning with You and Only You (originally titled The Curl Up and Dye), the first book in the series, followed by I’ll Stand by You and Saving Jake. I haven't read Sharon in a while. I will have to check this series out. Pamela, if you like heartwarming, small-town series, you will probably enjoy the blessings books. Mm1963, I like the series too even though I had some problems with this particular book.